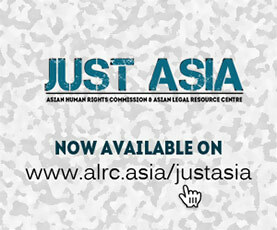 The Asian Legal Resource Centre (ALRC) wishes to inform the UN Human Rights Council (UNHRC) about on-going impunity problems in Indonesia. It is related to past human rights abuses which remain unaddressed since former President Suharto stepped down in 1998 until now. So far, we note that the Government has yet to show a serious willingness to address and tackle past human rights abuses. This remains despite the fact that human rights is recognized and written into Indonesian Law. The Government has ratified key international human rights treaties, yet they have yet to become a priority policy of the current Government. We have learned that the current human rights situation is not relevant anymore with President Widodo’s vision and mission written in the Nawa Cita (priority agenda nine). They were addressing past human rights abuses as one of the main priorities. The Government also promised that the State at present will ensure protection of human rights. However, the Government remains reluctant to touch the issue of past human rights abuses. After more than 20 years of political reform, transitional justice in Indonesia has gone nowhere. In the last ten years Indonesia has faced two Universal Periodic Reviews (UPR); namely UPR second cycle 2012 and third cycle 2017. In these sessions we note that the UPR issued very strong recommendations to the Indonesian Government to address past human rights abuses without undue delay. In addition, countries who were involved in the Indonesian UPR raised concern and support for the transitional justice of Indonesia with its willingness to provide justice and remedy for victims and their families. So far, the National Commission on Human Rights (Komnas HAM) has submitted seven cases to the Attorney General (AG). However, the AG is reluctant to further investigate these cases. On the contrary, the AG avoids the ad hoc Human Rights Court as mandated by Law No. 26 of 2000 of the Human Rights Court. The seven cases are: #1 Student shootings in Trisakti and Semanggi 1998-1999; #2 Enforced disappearances of student activists 1997-1998; #3 May tragedy 13-15 May 1998; #4 Talangsari massacre 6-7 February 1989; #5 1965-1966 massacre; #6 Mysterious shooting 1981-1983; #7 Wasior and Wamena Papua 2001-2003. The presidency of President Joko Widodo aka Jokowi has one more year left (2018-2019), as he was elected and inaugurated in October 2014. None of above mentioned cases had been investigated by the Attorney General. In 2018 we noted little progress. On 31 May 2018, President Joko Widodo received representatives of victims and their families of past human rights abuses at the Presidential Palace. In the meeting, President Widodo promised the victims that he would discuss the cases further with the Attorney General. On the other hand, victims and their families urged President Widodo to recognize the past human rights abuses and resolve the cases. This was the first formal meeting between President Widodo and the victims who have been organizing the so-called “Black Thursday Demonstration” every Thursday in front of the Presidential Palace since 2007. However, three months after the meeting, President Widodo has not yet shown any follow-up. There is no real effort by the Government to address impunity. On the contrary, President Widodo’s cabinet member, retired Army General Wiranto, the Coordinating Minister of Politic, Law and Security (Menkopolhukam) introduced a controversial idea–namely a Council for National Harmony (Dewan Kerukunan Nasional). He is the former national Military Chief, allegedly involved in the case of crimes against humanity in East Timor during a referendum in 1999. He is also allegedly involved in the cases of student shootings in Trisakti and Semanggi 1998-1999. General Wiranto’s proposal is not merely controversial but in violation of Law No. 26 of 2000 of the Human Rights Court. Here the Law clearly mandated that gross violations of human rights, in particular those that occurred in the past, must be tried before the ad hoc Human Rights Court. Moreover, the idea is also in violation of the international Human Rights Standard and Treaties where Indonesia is a State party. Widodo’s administration, ending in 2019. 2. Stop non-judicial efforts, such as the Council for National Harmony (Dewan Kerukunan Nasional undermining the standards of justice and the Rule of Law. 3. Immediately reshuffle the cabinet minister. In particular, replace Retired Army General Wiranto. This is due to his alleged involvement in the case of student shootings in 1998 and East Timor in 1999. 4. Comprehensively evaluate and replace the chair of the Attorney General, Mr. HM Prasetyo. The AG has shown his unwillingness to obey Law No. 26 of 2000 of the Human Rights Court. 5. Invite and cooperate with the UN Special Rapporteur on the promotion of truth, justice, reparation, and guarantees of non-recurrence.